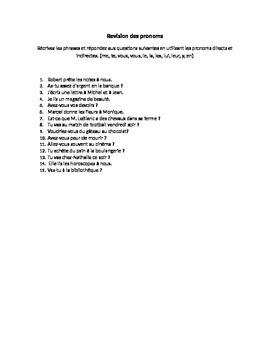 This handout and worksheet packet contains 5 pages of documents to review French Direct AND Indirect Object Pronouns! That's right-- all TWELVE of them! 1. Page One (handout)-- contains 2 charts. 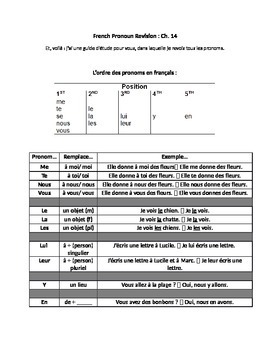 CHART ONE: the order of pronouns in French; CHART TWO: each of the 12 pronouns is listed with a column telling what it REPLACES in a sentence and an example sentence for each!! 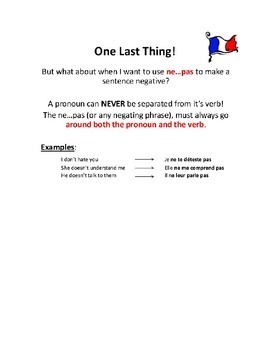 It can be used as a quiz, in-class worksheet, homework, or even just extra practice!